It's a classic story really. On a cold Winter morning sometime in January, while co-sleeping with my 13 month old son, he began to stir, cry and throw himself around for no reason at all. It was probably 6:30 am and I wanted just 20 more minutes of sleep so I shut my eyes and let him do his thing. If I tell you it felt like the Hulk had entered my room with a sledge hammer just to hit me directly in the face, I wouldn't be exaggerating. Logan head butted me in the nose...hard. He broke the upper bridge of my nose with his precious mighty skull. Fast forward to pools of blood, loud screaming and general flipping out, I'm in the ER with my mom about an hour later waiting to be examined. As part of normal procedure, the nurse asked me to take a pregnancy test before x-rays...sure no problem. As I sat there with an ice pack on my nose, the tiniest and slightest possibility of it coming back positive crept into my head. I was fairly certain there was no way though. I had stopped breastfeeding my son just a month before and my cycle was all wild and weird. Oh and there's also the negative pregnancy test I took just 4 days before the face break. So I shook it out of my head and closed my eyes. I started thinking about how my damn face would heal, would I need surgery, when the hell would surgery happen, etc. When the doctor walked over about 10 minutes later and said "so I have to tell you that the pregnancy test came back positive" I cried painful, happy tears. The doctor thought I was upset - I wasn't - my face was just broken. I was speechless happy. He preceded to tell me I couldn't have any x-rays or do much for the nose at this moment which was fine because I had stopped listening to him anyway. I was thinking "Who cares about my stupid broken face! Logan's going to be a big brother!" I'm now 28 weeks. I'm approaching my 3rd trimester and so much has changed. Logan has grown tremendously these past 6 months - in wonderful ways, in challenging ways, in adorable ways and in stressful ways. His personality shines bright, which I've said countless times, and his feelings and emotions are the center of my world. When he turned 17 months old and I continued to get more and more pregnant, we decided it was time to end co-sleeping in our bed and put him in his own room. Newborns are no joke and I'm not blind to this. Nevertheless, Chris was sick of getting kicked in the stomach and we can't forget the head smash. Logan was needing his nighttime freedom, I could tell, even though he's attached to me like a third leg. I took my time that month to transform his room into a happy space. I wanted it to be an inviting place, an environment with happy decor, comforting essential oils, a soft floor bed to encourage exploring and a few touch ups to make it feel special. Getting him to sleep in there has been a breeze - getting me out of there has not. I sleep with him many nights, mainly to help with the transition. On occasion I sneak out but he comes and finds me every now and then because he's a cuddler and always will be. I think we did this at the perfect time though. 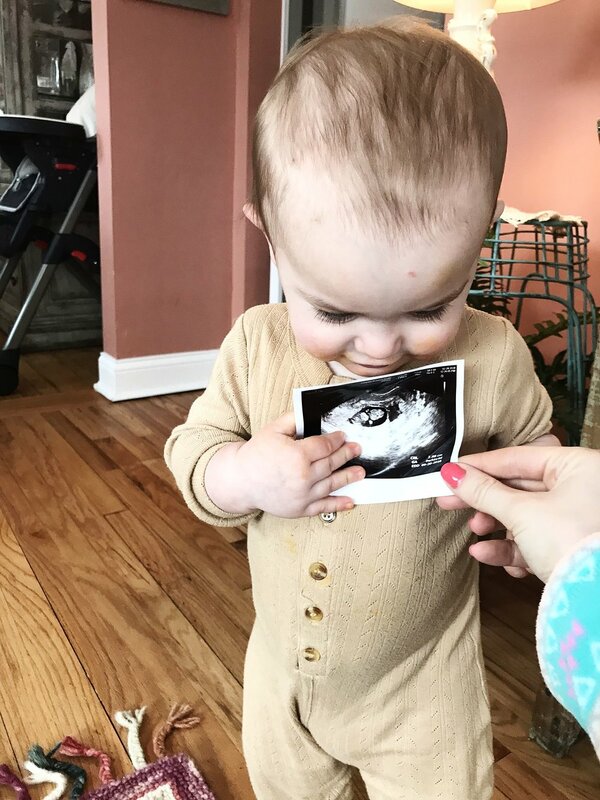 New baby is coming at end of the September so this is giving us a few months to continue focusing on him and being present through all of his emotional changes...cue next blog post. A little on this pregnancy though! I will say it's been pretty uneventful which is exactly what you'd want. First trimester stunk like most do and was extra hard because once a mommy, always a mommy. There was no time for me to take a nap or go to bed early just because I was feeling sick and horrible. But the crap phase passed by week 13 and while dedicating all of my time to my toddler man Logan, I've watched my belly grow. I get subtle moments with this one at night, when Logan is asleep and it's just us. This is a calm little soul though and only lets me in when I've settled down for a moment. Different from my first pregnancy, which kicked the heck out of me 24/7, I have to work for this secret connection with new baby and I'm just loving it. Something tells me this baby will be a whole new and different experience and I'm getting more and more excited for what's to come. Logan will undoubtedly be jealous but he also loves a buddy and can be sweet beyond words. I already bought him a Charlie doll from Hazel Village, which will be part of his present from the baby. I figure mama has a new little one to care for and he'll have his own too. Or he may hate it, don't know! For now, I'm soaking up this time with my little guy. I'm holding onto these fleeting moments, breathing in his littleness and bottling up all I can while it's just us.